The United Kingdom has been one of the most important regions for esport’s rapid billion dollar growth in the last few years, with guaranteed sold out crowds gathered for every Electronic Sports League UK event held in the country (ESL is the premier eSports competitive league for Ireland and UK) hosting League of Legends, CS:GO, Hearthstone and Overwatch tournaments. Esports in the UK doesn’t look like it’s slowing down in both revenue and popularity any time soon. With a massive fanbase positively rabid for competitive Counter-Strike: Global Offensive (the #1 most watched esport in the UK), and equally growing audiences for Fifa, League of Legends, Overwatch, and Rocket League, the UK will continue to be a hotspot for some seriously great pro gaming events. If you live in the UK and want to bet on both local and international esports tournaments, our special guide aims to point you in the right direction. United Kingdom residents can choose from a large number of locally licensed and regulated esports betting sites thanks to the country’s leading gambling legislation which ensures most of the world’s best online sportsbooks actually run and are licensed in the UK – and all of them have full betting markets for the most popular esports tournaments of Call of Duty, Counter-Strike: Global Offensive, Dota 2, League of Legends, Halo, Hearthstone, Overwatch, Rocket League, StarCraft II, Warcraft and more. UK residents are some of the luckiest in the world when it comes to online betting or online gambling of any kind, because the government and the United Kingdom Gambling Commission (UKGC) have effectively licensed and regulated online bookmakers in the country, and fair and safe online betting practices are enforced strictly in the region. The UKGC has announced their efforts to specially regulate the rising boom of esports betting markets, which include skin betting and esports lottery betting. The world’s best online sportsbooks are based, licensed and regulated in the United Kingdom, so it definitely made our job harder to narrow down the best picks for our readers. Is it legal to bet on esports in the UK? Yes, so long as you are over the age of 18, you can legally and safely bet on esports. The United Kingdom is one of the luckiest in the world when it comes to licensed, regulated and safe online betting. Since the introduction of the Gambling Act 2005 (applying to England, Scotland and Wales) and the creation of the United Kingdom Gambling Commission (UKGC) the country has been the leading trailblazer in embracing the growth of Internet betting and gambling with proper, effective legislation to keep its citizens safe (especially minors) while betting online with their real money. Because it has done this, most of the world’s best Internet betting operations have been running out of the UK for years, and the UKGC has since become the top name in licensing and regulation for local and offshore-based online betting and gambling operators. Basically, if a site has official UKGC licensing and/or recognition, it’s pretty much a given they are a legitimate and trustworthy betting site to place wagers. The UK economy has captured a large chunk of gambling revenue from their significant legalisation and regulation efforts, and that includes a large portion of the growing esports betting market. 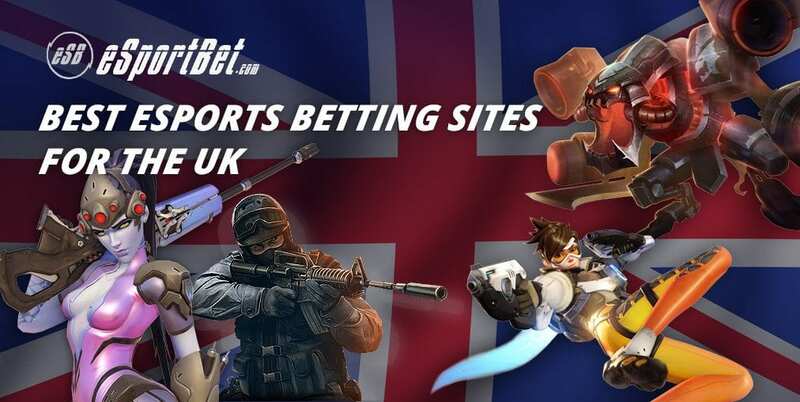 UK bettors can deposit and withdraw money for their esports wagers safely thanks to a wide range of secure payment methods supported at UK-licensed online bookmakers – and you can also bet in pounds (GBP) without the need for currency conversion fees. Credit, debit and pre-paid cards are widely accepted and highly regarded as the top options for any gambling-related activities, including esports betting, and MasterCard and Visa is almost always accepted. Transferring money through your personal bank account into your bookmaker account is also supported and recommended. Alternative banking options for UK esports punters who want a little more privacy or anonymity include virtual web wallet services such as Neteller and Skrill and pre-paid card services like Paysafecard, which can be bought over the counter at many local stores across the country. How popular is esports and video games in the UK? According to market insights from NewZoo, there are over 3.3 million esports enthusiasts recorded living in the United Kingdom in 2017. The majority of UK esports fans are aged between 21 – 35 and around 31% of these viewers are female. Alongside the rest of Western Europe, UK fans were responsible for 29% of the $32 million in total ticket revenue earned from major esports events held in 2016 (around $9,280,000) and hosted 26% of said pro gaming events (out of 424) with prize-pools above $5,000. The United Kingdom and the rest of Western Europe also accounted for 12% of the total recorded $93.3 million in major event prize money handed out to esports winners in 2016 (around $11,196,000). The United Kingdom is the #5 market worldwide in terms of video gaming revenues. There are over 32.4 million gamers in the UK who will spend $4.2 billion in 2017, according to NewZoo. Console gaming dominates as the biggest segment of the gaming market, with recorded revenues around $2.0 billion, while mobile gaming will reach $1.1 billion and PC/home computer market $0.8 billion. Out of all the most popular esports franchises in the world, Counter-Strike: Global Offensive takes the cake as the #1 most watched esport in the United Kingdom. 50% of these viewers are over the age of 30, versus 40% of the actual professional players they are watching. League of Legends esports is a close second in terms of current popularity in the UK. How many people in the UK bet on esports? According to a position paper released by the United Kingdom Gambling Commission, ‘Virtual currencies: eSports and social casino gaming‘, 8.5% of adults in the UK have ever placed a bet on esports, with recent participation hovering around 3% when the paper was first published (March 2017). 88% of these adults have bet with real money, 90% of bet with in-game items (skins, loot boxes, etc) and 78% of bet with both money and in-game virtual items. 58% of these UK bettors are men, and 42% of women, the latter of which is reported more likely to bet with in-game items rather than real money.